More and more homeowners are working remotely or working from home instead of spending more time in the office. More and more homeowners are working remotely or working from home instead of spending more time in the office. So, it becomes more important that these home offices are furnished as comfortably as possible. Comfort isn’t the only factor that goes into designing a superb home office. You want your home office to encourage productivity, to help you focus, to motivate you, and also spur your creativity. 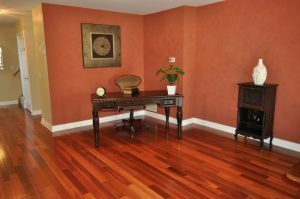 Here are some more factors to consider when choosing hardwood flooring for your home office. Consider the physical dimensions of the room. Think about how many windows and doors are incorporated into your home office space. Keep in mind what your home office will be used for. If you are an accountant or real estate agent, your home office will likely be much different than a musician or a painter. Be mindful of interior design and decorations. How will color and light affect the look and feel of the space? The overall aesthetic design of the house or apartment you call home. Your own tastes for designing your home office. Once you have arranged the rest of your home office, you can choose the flooring to match or to provide contrast. Have it all come together with the right flooring. How much foot traffic do you expect to come through the room? Will your children and pets be keeping you company? If you have a constant stream of visitors and clients, you will want to choose a type of flooring that can withstand all of that coming and going. How will the change of seasons affect your floor? Summer humidity, winter cold, fall chills, and spring mud will all have different effects on your new hardwood floor. What maintenance can you afford? What sort of look would you like your floors to have? Hardwood Flooring: Hardwood flooring is iconic. Different species of wood can give your floors different looks, but remember that this type of flooring will require responsible maintenance to keep it look its best. Engineered Hardwood: Multiple layers of wood are compressed together to create this beautiful, less expensive alternative to traditional hardwood. This entry was posted on Friday, August 4th, 2017 at 2:42 pm. Both comments and pings are currently closed.